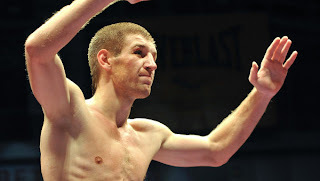 Just a few hours ago, Dmitry Pirog successfully defended his WBO Middleweight title against Japan's Nobuhiro Ishida. The fight was fun to watch and the right man definitely won, but Pirog should really be performing better against the likes of Ishida. Ishida is a good boxer, but his only good win is over James Kirkland who isn't a defensive genius. Pirog will probably fight again in August, and he will most likely have a unification fight with IBF Middleweight champion Daniel Geale. Based on Pirog's recent performance, I'd say he beats Geale, but the fight will be very competitive. I also think Sergio Martinez beats Pirog based on today's performance. But maybe Pirog is a guy who only puts on his A game once he is fighting the top guys in the Middleweight division. I hope that is the case because if it isn't, some of the other champions and contenders at Middleweight give him a very tough fight. Were you impressed with Dmitry Pirog?